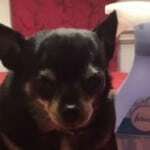 This post is sponsored by Swiffer® and the BlogPaws Professional Pet Blogger Network. for the content of this article. 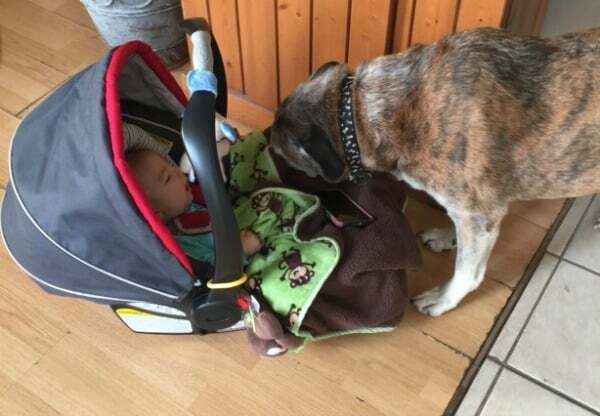 When my 3 kids were born over 20 years ago, there were already multiple animals in our house. So they grew up around them from the very beginning. The same is true with my grand kids. 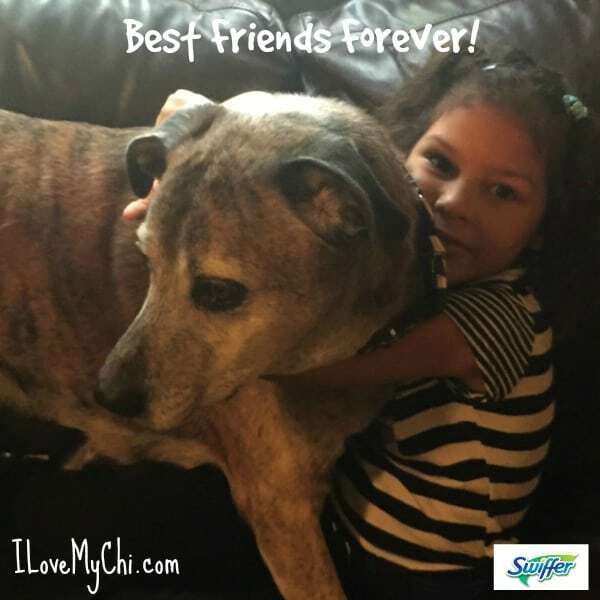 This is my 6 year old granddaughter May and her German Shepherd/American Bulldog “brother” Buddy. May’s mother April is my daughter and when April was a teenager, she adopted Buddy when he was just 5 weeks old. He was her baby and she was his everything. 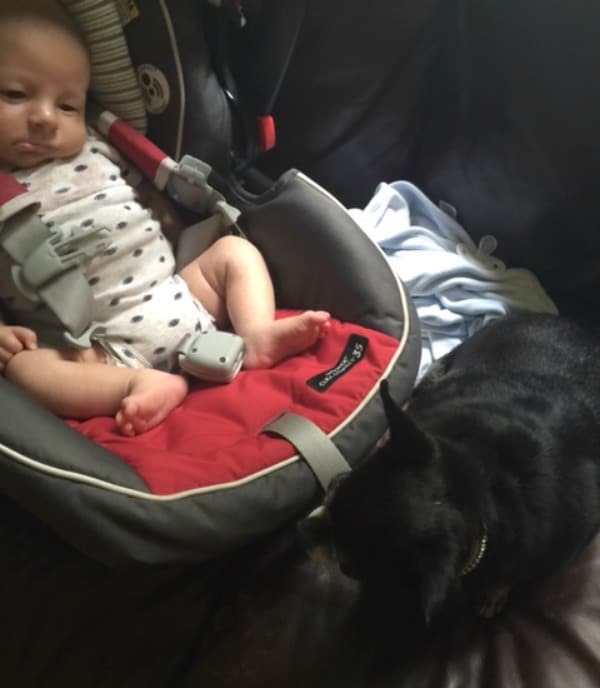 So when April brought May home from the hospital he was not too happy sharing his “mommy” with a tiny human. But gradually, things changed. I noticed he would get upset when May would cry and I didn’t immediately go pick her up. And he would “guard” her from the other dogs. He didn’t really need to guard her; the other dogs loved May but I guess he felt like he had to protect her. He would sit by her wherever she was. And at night, he would check her crib multiple times all night long just to see if she was okay. Now they are the best of friends and he lets May do a lot of stuff to him that he won’t let anyone else do. Such as hug him as shown in the above photo. He doesn’t like being hugged and will try to wiggle away when anyone tries to hug him. But he lets May hug him all the time. Heck, he’s even let her ride him like a pony a few times. I’m sure Buddy would protect his little “sister” with his life. Buddy is checking out his new “little brother” Ollie. He doesn’t seem jealous of him like he did when May was first born but he doesn’t quite now what to think about him. Kilo on the other hand adores the new baby and has decided that little Ollie is her baby. I wonder if it’s because she finally found a human her size. Her mothering instincts have really come out with this little guy. So sweet! Now I think I’m a great mom and grand mom but I’m not the cleanest person in the world. House cleaning is something I detest. I hate cleaning but I like a clean house. And now that I’m watching little Ollie during the days while his parents are working, I feel like I should be keeping the house cleaner for him. The extra dirt that comes with having pets would never deter me from having my pups. To me, living with animals is one of the greatest joys in life. 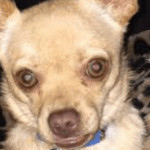 But it may make other people think twice about adopting a dog or cat. That’s why I’m so excited that Swiffer® and Bark & Co. are providing 10,000 Welcome Home Kits to participating shelters across the country through December. 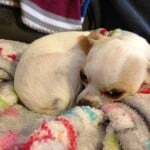 Swiffer is also making a $50,000 total donation to select shelters to support their needs this holiday season! The campaign wants to spread the word that cleaning concerns should never be an obstacle to adopting a child’s first pet this holiday season. 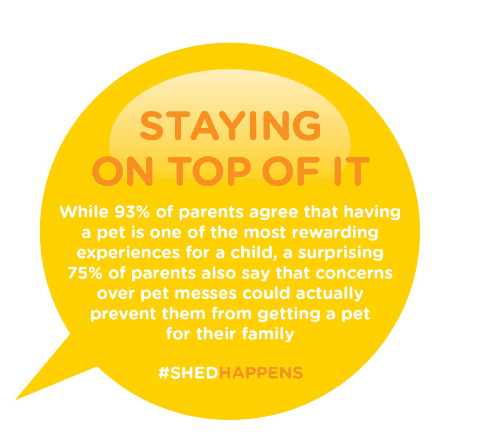 If you do adopt a pet through a participating shelter, please share a photo of your new furever family and everything in your Welcome Home box with @Swiffer and @BarkBox on social media to show how ready you are for when #ShedHappens. 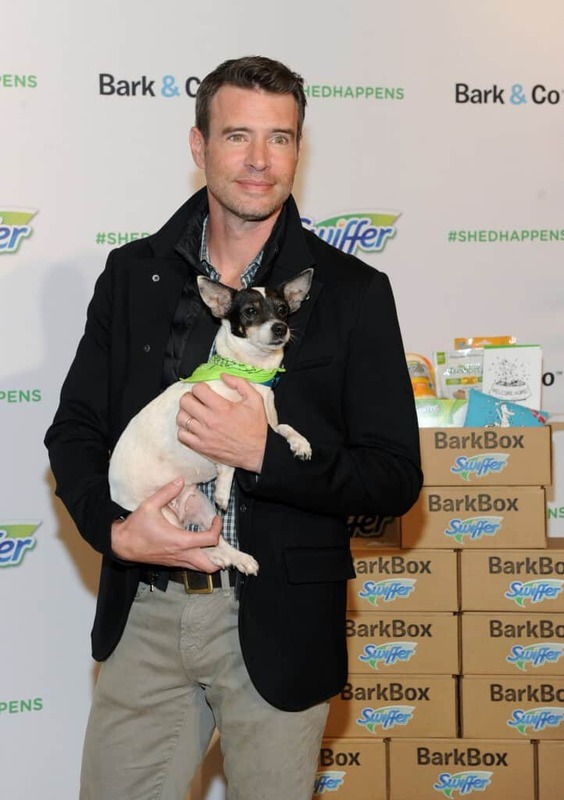 Scott Foley helped to celebrate Family’s First Pet and the wonderful relationship that comes with adopting a child’s first pet. 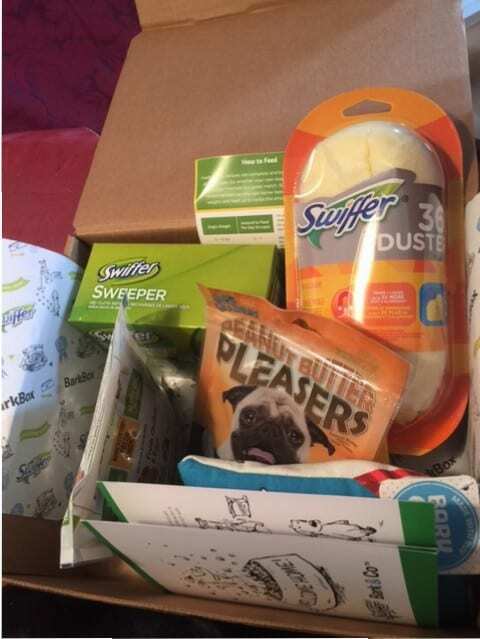 I got my own Swiffer-BarkBox Welcome Home kit to try out. The Welcome Home kit had some coupons to get a free Swiffer Sweeper Starter Kit and a free product from Febreze. It also had a sample of FreshPet food and a coupon for it too, some peanut buttertreats and a Bark toy, a Swiffer 360 Duster and a box of refills for it and a Welcome Home booklet for the new pet owner. Since I hadn’t tried the Swiffer duster before (and my house was pretty dusty), I made a quick video of me giving it a try on my dusty fireplace mantle. It did a great job of getting rid of the dust and dog hair. What’s funny is after I went to my office and started working, I saw my son pick up the duster and continue dusting with it. I didn’t even have to ask. Miracle! 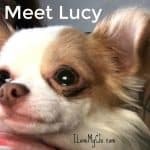 I’d love to hear about your child’s (or grandchild’s) first pet experience too! I bet you do! 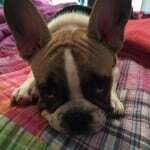 My daughter has a Frenchie and he sheds like crazy too. Funny how short hair dogs shed so much. Your grandkids are so cute. I have used Swiffer products for years. Great cleaning tools. Thanks Debbie! I agree, they are cuties!